They kept telling me that once we got through the terrible summer, the “summer of yuck” as we called it, that I would find light, happiness and health. They tried to reassure me, as we checked each week of chemo off the calendar, that I was one step closer to relief, to a happy ending, to life after cancer. They promised – everyone promised – that I’d feel better, that I’d resume work and parenting and everything in between, and that I’d be able to put cancer far behind me and move on. They were almost right. The summer ended, my health and strength returned. I am back to work almost full time. I am back to parenting way more than full time. I am technically cancer free, in remission, or, as I prefer to call it, #AfterCancer. But there is no light. There is no relief. Try as I might to take a deep breath, to feel healthy and whole, I am struggling in a darkness too dense to escape. I am now part of a community of people who, despite being in a community, tend to feel very alone and very frightened. From what I’ve heard from many survivors, we now live in a world of “what next” and “what if”. We go from scan to scan, counting the days then months then years (if lucky) since diagnosis. We have a language of words we cannot say, first among them, “recurrence.” We touch our bodies differently, feeling for lumps or bumps, noting every abnormality and planning our next call to the doctor. We aren’t sure if we are hypochondriacs or just hyper-aware of our bodies. We are cancer survivors: a growing (thank God!) community of people who have lived through the indescribable. Whether it was strength or prayers or community or just a lot of luck (or, in my case, all of the above! ), somehow we have survived cancer and lived to tell the tale. We should be grateful. We should celebrate. But we have a much heavier burden yet to bear. It is so very hard to forgive (our bodies) when we can’t forget (how our bodies betrayed us). The very act of rebuilding a trusting relationship seems too daunting and exhausting to explore, even when that relationship is supposed to be with the very face I see in the mirror. I move on, going through the motions of my life, smiling, laughing, playing with my children, enjoying my family and friends, my work, and my passions. But I am not really me, or at least I’m not the me that I was before I was diagnosed with cancer. Now I am older, wiser, wary and weary. And the place I am in is so, so dark. I am scared. I’ve gone from worrier to warrior (during chemo) and back to worrier again. I know things could be much worse, and in this season of darkness, I know there are many who live in a world much darker than my own. I pray that those who are in even more dark are able to find the light, just as some of them had helped me to find the light when I was sick and struggling. I am grateful that I had the best possible outcome – life! Now I struggle to find the light in that life. This is my burden, my darkness, my journey. This is my “right now”. Dark, getting darker as the seasons change, looking for lights, for sparks of light, for glimmers of hope. During Hanukkah we lit the candles, starting with one and increasing each night until the hanukiah was full and bright. My kavanah , my intention, is to focus on the ever-increasing light and joy in our lives. I pray that the story of the Maccabees – the victory of the small and insecure over the great and powerful – will be my story too, that my small and insecure new healthy cells will forever replace those nasty aggressive cancer cells. I will envision the miracle of the oil – meant to last one day but lasting eight – that it will be my miracle of long life as well. I will pray and hope. And perhaps one day, I will breathe in relief and light. Ilana Garber is a Conservative rabbi who has served Beth El Temple in West Hartford, CT since 2005. She lives with her husband and her two young boys (one of whom has Fragile X Syndrome). 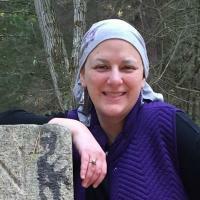 A feminist, an educator, and most recently, a survivor of Non-Hodgkins Lymphoma, she blogs about special needs, parenting, Judaism, and healing at www.ilanagarber.com.